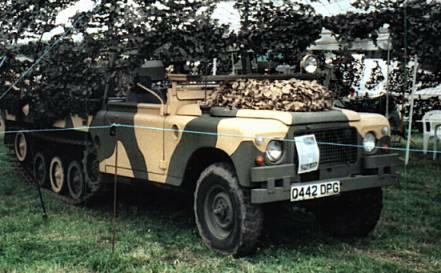 This vehicle was developed by Laird of Anglesey. 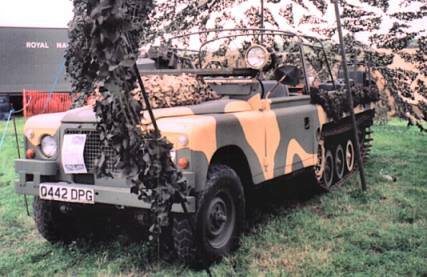 It uses shortened CVR(T) running gear for the tracks and the rest of the vehicle is the familiar Land Rover. It weighs approximately 3 tonnes and has a maximum speed of ~50 mph. This development dates from around 1978, but was ultimately not a successful design, despite much initial interest. There were six built with Stage 1 front sections and a seventh using a 110 front. 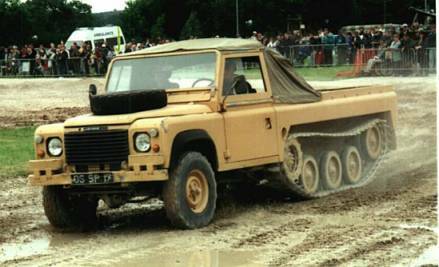 This latter vehicle is the only one in overall sand finish. It is an unusual vehicle and fully deserving of a place amongst the other tracked vehicles on this site. The pictures were taken by myself at Bovington Tank Fest 2002 and The War and Peace Show 2002.